How do you wish to book an appointment? You can request an appointment online here! With the correct diagnosis and treatment, we expect that your condition will stabilize. Will I get disabled in future? 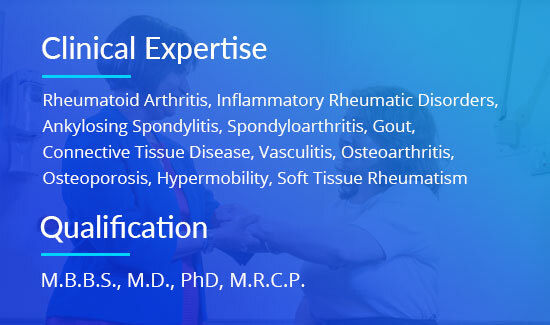 Now that your arthritis has been diagnosed early enough and that you will be starting the disease-modifying treatment, we expect to control the disease activity well enough to prevent future joint damage and disability. Would I have to take the treatment life-long? The immediate priority is to control the disease activity fully, which will be achieved by rapid escalation of drug therapy. Once an optimum therapy regime that controls the disease activity is identified, we will continue that for another 1-2 years. We will then consider reducing some of the drugs provided the disease is in remission. However, a risk of relapse cannot be excluded and in that case, the original drug therapy will be re-instituted. Autoimmune rheumatic conditions are more common in family members but not hereditary. Hypermobile Ehlers Danlos Syndrome (hEDS), the most common type of EDS is autosomal dominant in nature and poses a 50% risk of passing it on to offspring. Will I receive a medical report mentioning the diagnosis and treatment advice? We will email or send you a hard copy of the medical report within 1-3 days after the consultation.